Before the coming of Unicron, Rodimus was already a talented warrior, recognized by his comrades for his potential and lack of patience. When he became Rodimus Prime, he set out to lead from the front. He was always the first on the battlefield, and the last off, thrusting himself into the deepest danger rather than asking any of the robots under his command to sacrifice themselves. Rodimus Prime. To many original Transformers fans he's a scapegoat, a symbol of everything that went wrong with Transformers after the first two seasons of the 80s cartoon. But to me he's something different, and something far, far more. As a child born in 1984, it was Rodimus, not Optimus, who was the hero of my childhood Transformers adventures. He's always been an icon to me, and as I grew older he became more than that -- he became a symbol of how everyone has to grow up, but also of how growing up doesn't need to change who you are just because you've had new responsibilities thrust upon you. Considering that I'm nearly thirty years old and still spending my free time and disposable income on Transformers toys, I think it's safe to say that Rodimus Prime is more or less my role model. Because of my abiding fondness for the character, when I heard that a Masterpiece Rodimus Prime toy was coming out there was never any doubt that I would own it. But Takara's release of the figure was outside of my price range, and the innumerable QC issues that cropped up on the initial Takara release prompted me to wait for the later Hasbro release of the figure, which in turn had some nasty QC issues of it's own. 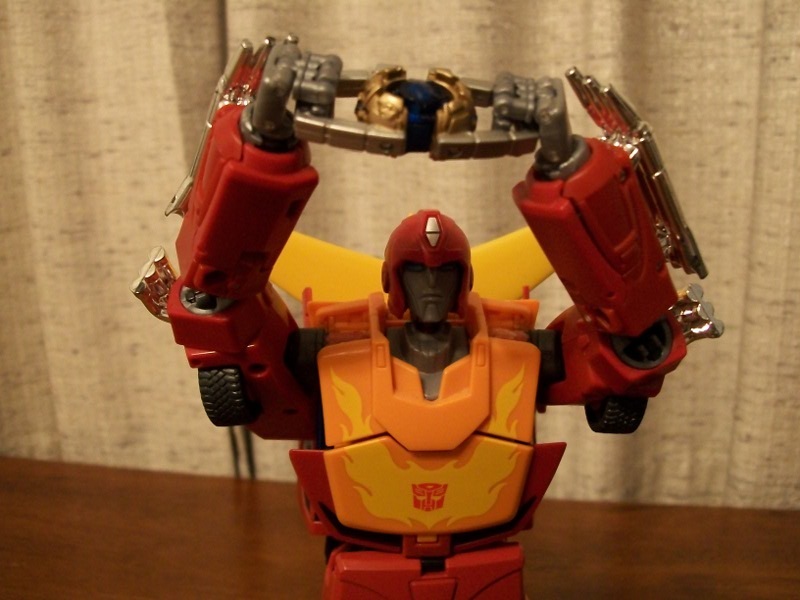 In fact, I had to return the first Rodimus I bought to the store because his arm had detached in the package. The differences between the Hasbro and Takara releases are many -- different colours, different accessories and the major one: Hasbro's omission of Rodimus's trailer. But the core of the figure remains the same, and it's one of the most ambitious Transformers I've ever encountered. Unfortunately, it's that ambition that undoes it in the end. 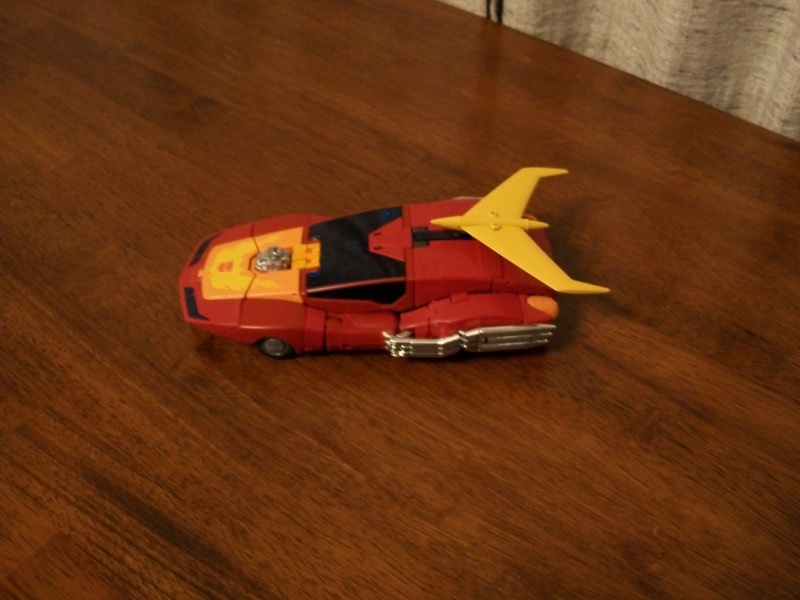 Robot Modes: Rodimus comes packaged in robot mode, and what a robot mode it is! I would say that he looks like he just strutted in off of an animation cell, but the truth is that he actually looks better than that. The Takara version used a colour schemed that was based on the cartoon model but Hasbro's toy goes in a different direction with a colour scheme that blends cartoon and toy details to create a whole that's greater than the sum of it's parts. Rodimus is huge, standing around ten inches tall, with loving amounts of detail, wonderful poseability and a level of faithfulness to the cartoon proportions that should be flat-out impossible in a transforming figure. He's mostly maroon with orange, yellow, grey and chromed silver highlights, and is in my opinion one of the most beautiful figures ever to have the word 'Transformers' on the package. But one lovely robot mode isn't enough for this toy. No, the Takara designers -- clearly of the mind that anything worth doing is worth overdoing -- decided that making a Masterpiece Rodimus Prime wasn't enough. Because this toy isn't just Rodimus Prime, it's Hot Rod as well. 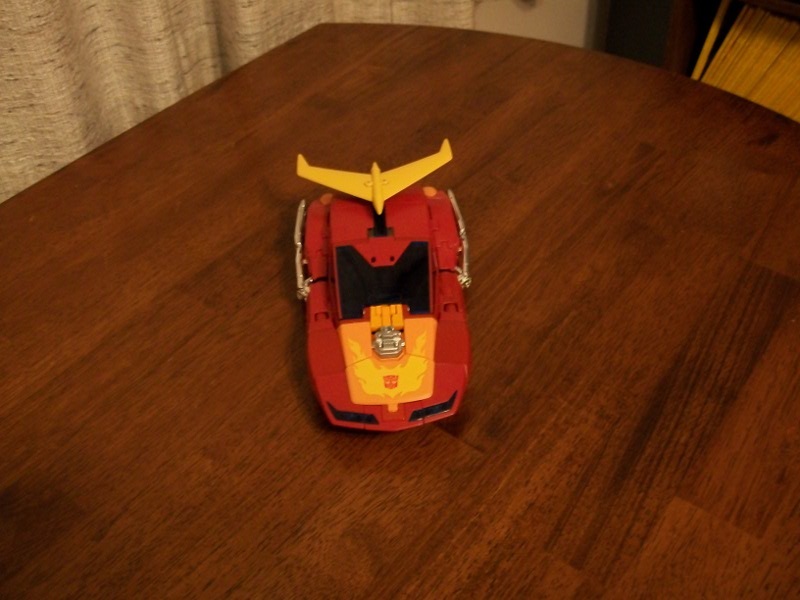 One quick face swap, some adjustments to his spoiler and a repositioning of his hips later and the toy is now the spitting image of Rodimus's younger self! Though the cartoon models for the two are pretty similar (and in fact often got confused for one another), the toy looks surprisingly different from one robot mode to the next. Hot Rod looks young and powerful while Rodimus is taller, leaner and has an air of authority about him. Since he's marketed as a Masterpiece figure, you would expect Rodimus to be very poseable. And you would be right! He has a full range of motion in his neck, elbows, waist, hips and knees as well as articulated ankles and fingers. His shoulders have some minor mobility issues due to the design the toy is replicating, but not bad enough that you'd notice on a lesser toy. The ankles make it pretty easy to balance Rodimus, and the fact that his feet are made from die-cast metal (an apparent reference to the 80s Hot Rod and Rodimus Prime toys) helps quite a bit by lowering his centre of gravity. The end result is a toy that's more poseable than a lot of nontransformable action figures, and while he's a bit too big and heavy to be properly called a 'toy' in my books he does make for a great display piece in countless different poses. Rodimus also comes with an impressive number of accessories. He has two handheld rifles meant to evoke the original Hot Rod's guns, which can also combine to form Rodimus Prime's distinctive photon eliminator rifle. He also comes with a more-or-less Legion-sized version of Hot Rod's Targetmaster partner Firebolt Sparks Offshoot, making Rodimus one of the most heavily-armed robots in the Autobot army when you take into account his wrist blasters. He also comes with two different Matrixes of Leadership, a small one designed to fit inside his torso and another, larger one that looks good in his hands. And if that weren't enough he comes with a saw blade and welding tool that can replace his hands to replicate memorable scenes from the 1986 movie and features a set of deployable 'sunglasses' to replicate yet another scene. Rodimus isn't without his flaws, though. His lower legs are made up of many different panels that don't want to fit tightly together, leaving unsightly seams in his shins. His chest has similar problems and the collection of odds and ends that form his backpack don't like to stay pegged together at all. 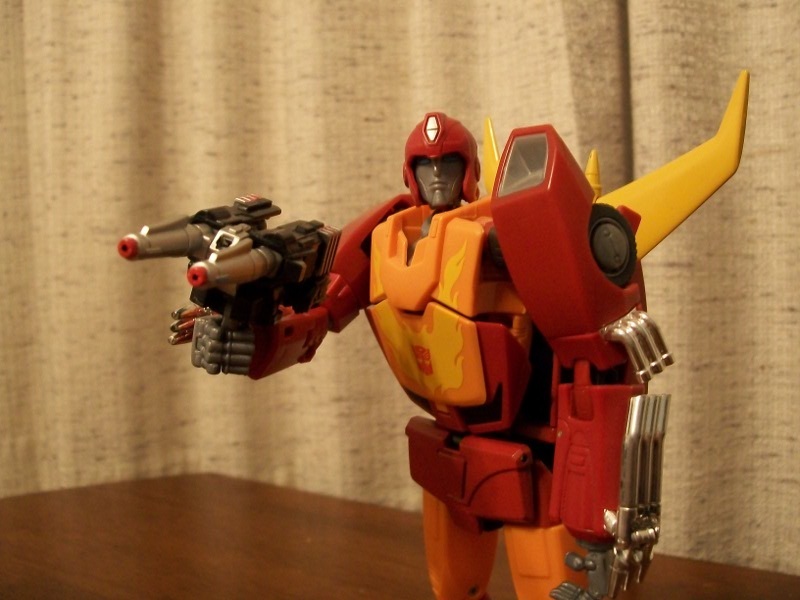 Rodimus also has way more trouble than he should holding his weapons due to a less-than-optimal hand design. None of these are huge issues, but on a big-ticket figure at such a large scale they're really unnecessary. Alternate Mode: In spite of being called "Masterpiece Rodimus Prime" this toy excludes Rodimus's trailer, which means that the alt-mode is all Hot Rod. Considering how plain Rodimus's vehicle mode is and how much extra money I'd have to pay to get that featureless box, I'm okay with that. But even still, I'm not a fan of this toy's alternate mode at all. This isn't entirely the toy's fault; I've never really cared for the weird, curvy vehicle that cartoon Hot Rod transformed into and always preferred the single sharp wedge of the original toy. However, the fact that his transformation is one of the most frustrating things I've ever had to to as a fan of the brand most definitely is the designers' fault. Though they manage to replicate the on-screen car mode fairly well, that replication comes at the cost of making the toy very fragile and the transformation process a nightmare. 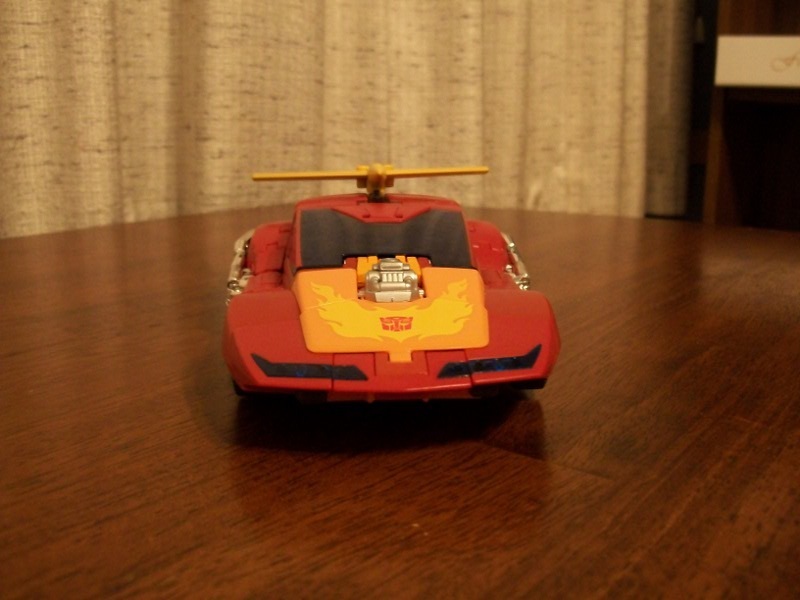 Once he's in alt-mode though, Rodimus looks the part. He's still mostly maroon with an orange, flame-decoed hood and the obligatory silver chrome exhaust pipes running down either side of the car. He's also gigantic by Transformers standards, easily the largest Autobot car I've ever seen and probably too big to actually play with as a car. He definitely pulls off the look the designers set out for, that much is certain. Targetmaster: As I mentioned earlier, Rodimus comes with Hot Rod's Nebulan sidekick, renamed Offshoot for trademark reasons (though his name wasn's consistent even in the 80s, so whatever). 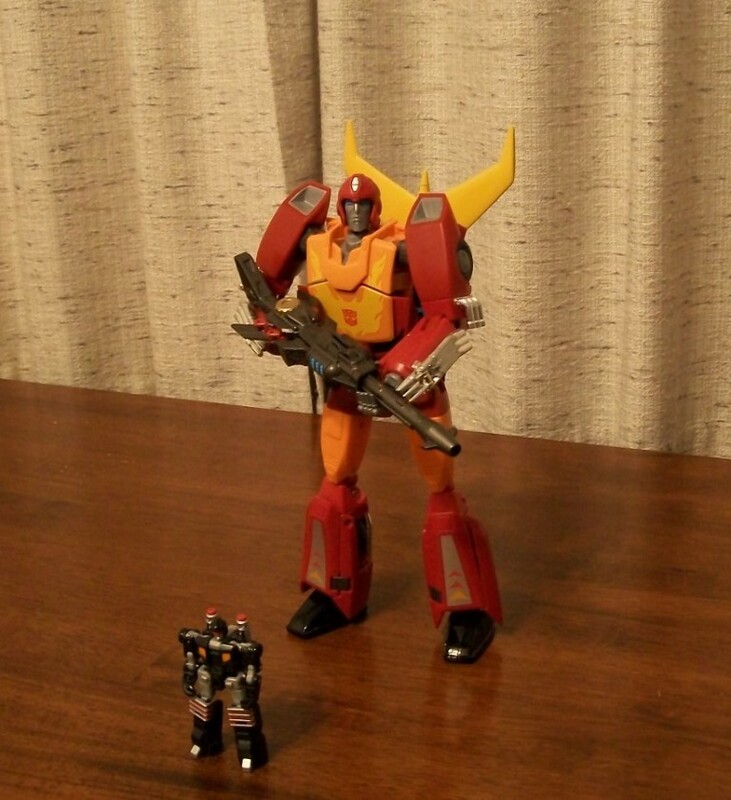 Since Rodimus is nearly three times the size of Targetmaster Hot Rod, Offshoot is thus quite a bit larger and more detailed than Firebolt was. He stands about as tall as a Legion figure and carries over the original's black, grey and red colour scheme, though with a far more complex deco than the original, tiny Firebolt. Offshoot is, in fact, easily the smallest fully-articulated Transformer I've ever seen. He features everything you could ask for in such a tiny figure except for a waist joint, and is tremendously poseable. His transformation to gun mode takes full advantage of all those joints, taking what could have been a weak folded-over robot like the original and turning it into a believable sidearm. My Offshoot sadly suffers from an assembly error -- one of the pins holding his arm together was driven in on a bad angle, and while it doesn't seem to hinder the joint's movement it's unsightly and probably reduces the limb's durability quite a bit. This seems to be a one-off error though, or at least I've never heard of anyone else reporting the problem (and the Offshoot that came with my first, broken Rodimus was fine). Offshoot only comes with the Hasbro version of Masterpiece Rodimus Prime, and other than the toy-based deco (which I prefer but some won't) is one of the biggest differences between the Hasbro toy and the Takara one. As someone who grew up with a Targetmaster Hot Rod that frequently took command of my Autobots, I think it's a great touch.